The lines between culture, news, politics, war, and entertainment have blurred, and are now streaming in every direction through the internet's cracked screen. Sprinkling KKK crackpots with some useful subversive digital counterculture has given white supremacy a new lease of life. What will be the real-world consequences of forcing such figures out of their semi-ironic anonymous online fantasy land, and potentially thrusting them into a toxic flirtation with violent offline tactics? Começamos a ter uma ideia da resposta, e se mais vale tarde que nunca por demasiado tempo a putaria nazi soube marcar presença online sem uma resposta daqueles que mais se lhe opõem. If you look in almost any western democracy, typically the most active political movement online is the radical right [e] the radical right has frequently been the most avid and enthusiastic adopters of shiny new technology, and have long found the internet a uniquely useful place. Many of them believe that the internet is a revolutionary way to tap into the voice of the people, that mythical “general will” that all tyrants purport to represent. If Mussolini were alive today, he would be an avid cheerleader for social media. Anders Breivik maked clear his belief that social media – especially Facebook – would help the white “resistance movements” fight back against multiculturalism, because it offered new opportunities to push propaganda and connect with like-minded individuals around the world. The point is this: radical groups, especially those on the radical right who dislike openness and worry about diversity are extremely comfortable on the platforms that are meant to promote exactly that. Voltando à luta: fechámos da importância da esquerda de apontar baterias a novas formas de cultura com um "bottom-up culture of breathtaking diversity" e repensar o Estado Ama. Enquanto se espera por soluções coerentes e alternativas viáveis, o Real vai-se adiantando à realidade. War has moved beyond the battlefield into an all-encompassing struggle in economics, politics, and culture, along with old-school physical confrontation. In this new kind of warfare, where the allegiance of civilian populations is crucial, control over narrative and messaging is often more important than killing the enemy or holding a particular piece of ground. Looming in the background behind all of this is the disruption of centralized state power. Even as the US government remains an 800-pound hegemon, it has faltered at enforcing order in digital spaces and arbitrating disputes that arise over its use. That doesn't mean, however, that the internet is ungoverned. Into the vacuum rise new, undemocratic power verticals, centered on the tech titans in Silicon Valley. What distinguishes the current political conflict from past episodes of fascists, communists, and anarchists clashing in the streets of Western cities, according to Robb, "is the whole social networking thing." Dos punx e web, tech, social e anti-social. In the background, much of the fighting is being done online [graças a um] increase in the ability of individuals and small groups to accomplish tasks/work through the combination of rapid improvements in technological tools and access to global networks. 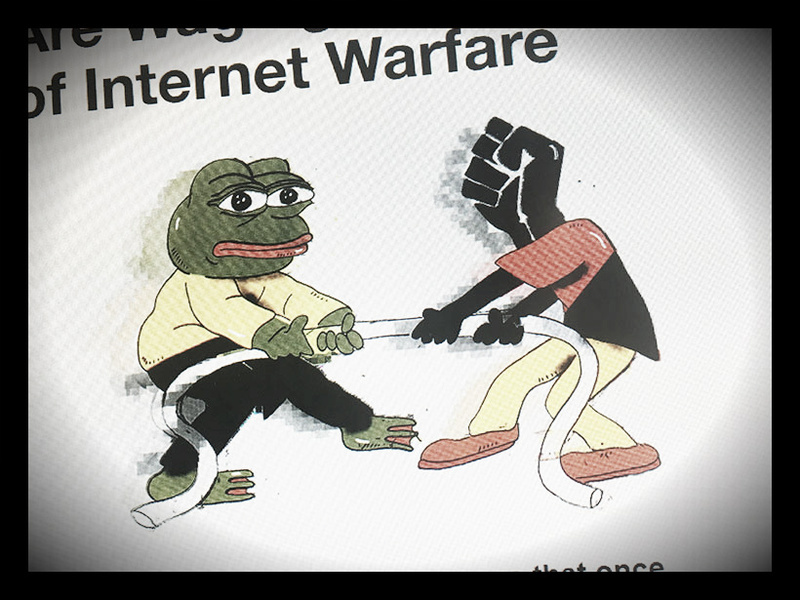 Memes, trolls, bans, doxes, sock puppets, and targeted disruption campaigns are being deployed in a cycle of attacks and counterattacks that, much like traditional military intelligence and information operations, set conditions for the next round of physical confrontation. Outing people at protests, doxes, and other methods of 21st-century combat: "Octavian did it to Mark Antony". [Há] plenty of continuity with classic intelligence techniques, along with some clever innovations. There's sock puppeting, someone trying to appear as if they're someone else, and then a riff on that is trying to appear as if you're a supporter but with the goal of trying to undermine that group, doing something embarrassing or provocative and steering them toward a bad end. That was a classic Cold War move. There are dossiers and black lists, agents and double agents, "good trolls" spying on Trump supporters and fake antifa accounts, disinformation and counter-intelligence campaigns carried out on message boards and chat rooms. We seem to be entering a new phase of bottom-up cyberwar. Instead of smaller sub-state groups forming strategic alliances to fight the government or private power brokers, affinity groups organized around ideology and ethnic identity are battling one another. Old intelligence practices and spy vs. spy tools are evolving and being adapted. Practices have clearly evolved in these new digital network, but old problems remain. Infiltration is perhaps the most obvious: In a world of spies, how do you know who to trust? Acusem-nos de saudosismo da web nos seus primórdios mas realmente temos saudades desta. Não somos os únicos. It wasn’t meant to be like this. Back in the 90s, when the internet was tiny, the digital prophets confidently informed us that limitless information and total connectivity would make us wiser, less bigoted and kinder.